There’s something about Japanese music, a sense of ‘otherness’ that sets it apart from western music, whether it’s in their approach, or whether they’re just a nation of weirdoes, I have no idea. I once saw an interview with Boredoms front-thing Yamatsuka/Yamataka Eye in which the theory that the Japanese race and culture developed from alien origins was put to him, to which his reply was something along the lines of “it wouldn’t surprise me in the least”. Japanese musicians tend to approach things from an unusual or previously unseen angle, not as a means of striking a pose, but because, well, that’s just the way they DO it! 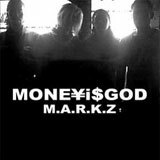 MONE¥I$GOD are no exception to this, and ‘M.A.R.K.Z’ is just as tweaked and individualistic as one would expect…however, even by the usual standards of Japanese ‘WTF?ness’, MONE¥I$GOD sound pretty damned odd. Imagine. If you will, Public Image Limited trapped somewhere between their first record and ‘Metal Box’, drunk, and fronted by the Cookie Monster, incomprehensibly gargling gravel. Yes sir, this is a STRANGE take on the post-punk sound. The press-release for ‘M.A.R.K.Z’ advises that this recording is recommended if you like Killing Joke, Zeni Geva, Pailhead, Arab On Radar, NoMeansNo and Six Finger Satellite, and I guess that, at a push, fans of those bands would find much here to enjoy….if the vocals don’t completely rub them up the wrong way. Apparently, MONE¥I$GOD have been around for over a decade, yet I haven’t been able to find any information out about them from before this release. I guess they were just another one of those bands that was confined to their country of origin. I am, however, familiar with vocalist Kam’s other job as frontman for 80’s crust-punk band Asbestos, but it seems, for some inexplicable reason, that his vocals HERE are actually harder to digest than in the anarcho-punk surroundings of Asbestos. Again, straaaaaaange. All of those post-punk hallmarks are present here – the rubbery, overpowering dubby basslines cranked up to 11, the thin, whiny guitars, touched by psychedelia, and the ska/reggae inflected rhythms – there’s just something ‘off’ about how everything hangs together, and the vocal stylings of Kan could really polarise opinion. It’s not that they’re BAD, it’s just that they don’t seem to sit right with the dubby, itchily rhythmic music. ‘Cancer’ kicks off with dramatically pounding toms, like a call to war, and is then joined by the undulating bass and the crackling, staticky guitar as they all rhythmically pound away in an awkward rhythm. When Kan comes in, he sounds like a grumpily caged Yeti, yelling and growling in an echo-chamber. The wah-psych guitar break is a nice touch though, I must admit. ‘Murasaki’ is a comparatively speedy li’l number that is driven by a guitar part that reminds me greatly of The B52’s or possibly The Cramps at their jolliest (? ), a kinda surf/garage sounding rock ‘n’ roll riff, almost, but with that big ol’ bass and a ska rhythm driving the chorus. Kan’s vocals sound particularly out of place here, due to the upbeat feel of the song. ‘Black Rainbow’ is more or less full-on skanking dub-funk, with a pummelling bassline and choppy, watery sounding guitars. Kan adopts a slightly creepy whisper for most of this one, aside from on what passes for a chorus, where he lets rip with enough gravel to comfortably cover just about ANY driveway. ‘Waltz’ has a vaguely waltzy, stumbling hi-hat driven rhythm to it with a particularly effective use of the powerful bass-tones and the angular wiry guitar that builds to crescendos, whilst Kan enunciates breathlessly over the more lumpen main body of the song. Slightly aimless, this one, I’m afraid. Finally, ‘Hate Song’ is another up-tempo number, replete with rubbery bass and spiky guitars and an even more incomprehensible than usual vocal from Kan. I have NO idea what he’s growling about, but I gather that he hates some kind of people. We also get a perfunctory solo from guitarist Kohji, about which I will say nothing. Again, a fairly aimless kind of song with a couple of parts repeated over and over again until it finishes. Aside from the vocals, it really doesn’t sound all that hateful to me. Now then. Tacked on the end of ‘M.A.R.K.Z’ is a ‘Monkey Was Dubbed Remix’ of ‘Black Rainbow’ that completely deconstructs the track and renders it completely without a groove, all pulsing directionless bass, dubbed out drum stabs and mangled vocals. Unsurprisingly, it’s a definite highlight of the record, due to its sheer oddness – even when put next to the oddness that comes before it. So, there you have it. A strange record indeed. I can’t say that I HATE it, but neither can I say that I LIKE it. The unsuitable, unsubtle, vocals, strangely stilted feel and general air of ‘not-quite-right-ness’ all took their toll on my ears I’m afraid. Tell you what though, GREAT bass-player!